What does KARUNI mean? It comes from a Hindi word karuna that means EMPATHY, ETHIC, EQUALITY OF MEN BEFORE ART, universal and eternal, LET MAN’S SOUL LIVE THROUGH THE ARTS. This is what we want to share with you. Ancestral arts carried on today, that match our contemporary design, creations from halfway around the world for you tomorrow, to respect the one who is manufacturing and the one who receives the articles. Our passion for jewelry, decoration and traveling naturally lead us to meet craftsmen and designers in every country we visited. From our journeys, we wanted to make people discover the most representative and especially the most beautiful objects –according to us- from each region we have visited and the ones who match perfectly our outfits and occidental interiors, while preserving their soul. We also worked with the craftsmen to revisit some jewelry that are contemporary-inspired while always following an ethnical style. We wish that from the producer to the client, everyone benefits from the sale and can have satisfaction. Experienced craftsmen and passionate designers realize all of the jewelry manually. These jewelers and cabinetmakers live in Agadez in Niger, Bamako in Mali and some towns of Mauritania, they work as cooperatives –either family co-ops or associations- and craftsmen associations. The articles are realized in conditions so as to improve the working and living conditions of the workers. We supply some of the necessary materials to the jewelry’s manufacture, file, ring gauges to measure the rings’ sizes, caliper, precision balance… because they are expensive and hard to find locally, as well as some photographic and computer hardware materials. The craftsmen usually shape their tools themselves with the pieces they can find. We think it is fundamental that craftsmen and producers are properly paid for their work, like this we can request the best from them and they can support decently their families. We also work through pre-financing, which enables to purchase of the entirety of the raw material and advance of salary. Every jewelry and article is meticulously examined at its arrival and we believe that craftsmanship can go with excellence everywhere in the world. Excellence in the raw material’s choice and excellence in its transformation. Sterling silver is used for all ethnic Tuareg jewelry, without any addition of other metal, which enables a very thin work especially for the engravings. 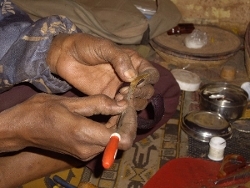 For some Mauritanian jewelry, silver 800 is used as it is effective to strengthen the jewelry. All of the jewelry in sterling silver has a hallmark -the RESPONSABILITY HALLMARK- delivered by the PRECIOUS METAL GUARANTEE OFFICE OF PARIS, which guarantees that the jewelry is at least in silver 925. It looks like an OVAL with A CROCODILE PATTERN HOLDING A STICK IN ITS MOUTH. This hallmark is exclusively delivered to the Karuni company and makes it possible to track this guarantee (the number 925 that we often see stamped alone on jewelry has no value as it could have been made by anybody). With time we have learned to choose and know our jewelers craftsmen partners and suppliers so as you, our clients, their clients, can fully appreciate the jewelry and articles you buy. The ethnic jewelry are for the most part sent in pouches made in Agadez in Niger, in wax fabric scraps, which provides an additional salary to the tailor’s workshop and to the women. Besides requiring quality, we think that by buying online you wish to receive as fast as possible your purchases. We commit to send your order as soon as it is registered. We can do customized orders or by wholesale, according to what you need, you can ask us all your questions on our contact page. We are a small company and over time we have developed strong relations with other creators who share the same ideas and values. We try to support each other and to share some operations, such as shared participations in exhibitions or communication and sale actions. We exchange quite a lot as well about our fabrication and working methods. Feel free to give us feedback on our products and to share with us all your suggestions, we are here to listen to you.